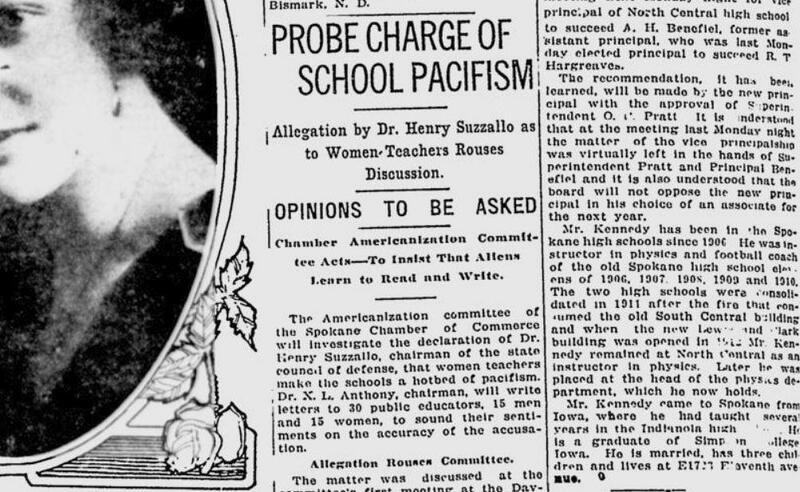 Do women teachers make schools a “hotbed of pacifism”? That was the charge made by Dr. Henry Suzzallo, the chairman of the state council of defense. The charge was serious enough the “Americanization Committee of the Spokane Chamber of Commerce” began an investigation of the matter. The chairman of the committee, Dr. X.L. Anthony, declared he was “inclined to agree with Suzzallo.” But Judge W.A. Huneke and Spokane School Superintendent Orville C. Pratt disagreed. Huneke also said women make better jurors than men, in his experience. The committee planned to write letters to 30 educators – 15 men and 15 women – to ask their opinions on the matter. From the streetcar beat: The Spokane Traction Co.’s entire streetcar system ground to a halt for two and a half hours in the middle of the afternoon. The problem? Wires were crossed up during maintenance at a substation, causing the generators to malfunction. A rumor spread that the streetcar workers were on strike, but the cars were up and running again by the evening commute.